Two interns, one city, endless options. Who has the best hamburger in the “Hub City?” We (Katie and Juno) set out on a quest to find out. These are the burgers voted on by our Visit Lubbock fans via Instagram, and we are here to tell you all about what keeps all of us coming back for more with a side of fries. 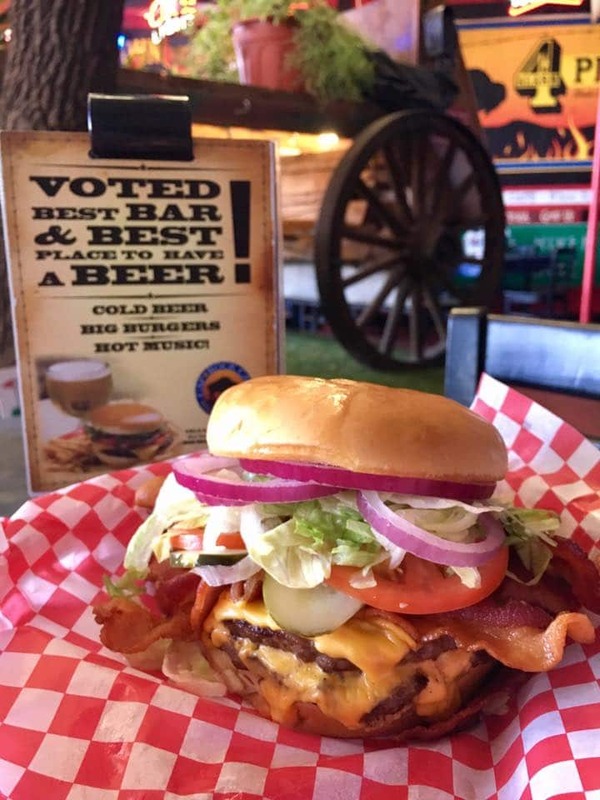 Serving up 21 years of cold beer, big burgers and hot music! Bring your “Texas-sized” appetite to Caprock Cafe to indulge in their Texan twist on American classics. One thing to note about this local favorite is their “Down & Dirty” sauce. For those of you who don’t know, this spicy sauce that originated from their sister Italian restaurant, Orlando’s, made from garlic spread and lots of habanero hot sauce to turn up the heat and flavor. Be sure to bite into one of their burgers like my personal favorite, the green chile bacon cheeseburger on a sweet sourdough jalapeno bun topped with fresh lettuce, tomato, onions and don’t forget the pickles! And if you really want to upgrade your burger, order the sweet potato waffle fries and I promise you won’t be disappointed. For those looking for a lighter option without compromising flavor, they also have buffalo burgers available to cut calories, fat, and cholesterol. Wrap those patties with white or wheat flour tortillas or even go for a low-carb, bunless option. 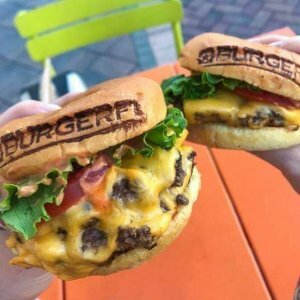 If a plain cheeseburger is too boring for you, then you’ll immediately want to head to BurgerFi and order up The CEO. It means business. On top of the “Double Wagyu + Brisket Blend Burger” (as if that’s not already enough to convince you) is homemade candied bacon-tomato jam, truffle aioli and aged swiss cheese. Is it just me or did it get hot in here? If meat isn’t your thing, the 100-percent plant-based Beyond Burger will not disappoint. It’s got all the taste of the classic cheeseburger just without the beef. Not that you’ll miss it. Twisted Root has a special place in our hearts. Their Dallas location was featured on Diners, Drive-ins and Dives in 2009, so it is Guy Fieri approved. It is place you can go to eat a gourmet burger just without the fuss, but all the fun. They have done a great job of creating a humorous atmosphere. Each order is given the name of a famous character or celebrity instead of a number and the custom pickle flavors are adorned with a coordinating funny meme. Aside from beef, they have many exotic meats to choose from like emu or buffalo for your patty. 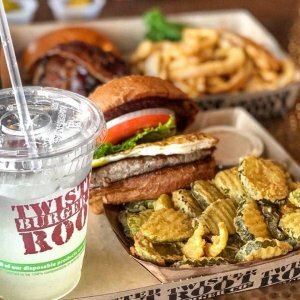 You can’t go wrong with their classic half-pound cheeseburger, but the unique part of Twisted Root is the specialty toppings. My stomach starts growling at the thought of their Freshman 15 burger with smashed fries on top, melted cheddar, fried egg & bacon. The deliciousness does not end with the burgers. The fried side options include some of the best fried pickles my mouth has had the pleasure of tasting. The salads are as aggressive and flavorfully creative as the burgers so don’t feel like you’re missing out if burgers don’t get you excited. You can never go wrong with anything on the Twisted Root menu. These Amarillo natives are all work and no play when it comes to the quality of their menu. They take pride in going the extra mile for customers with hand-cut french fries, homemade ranch dressing, buns baked fresh daily and never-frozen, 100% ground chuck for hand-made hamburger patties. As far as their burgers, go classic and grab a cheeseburger and if you like to live life on the edge, add grilled jalapenos for an extra kick. 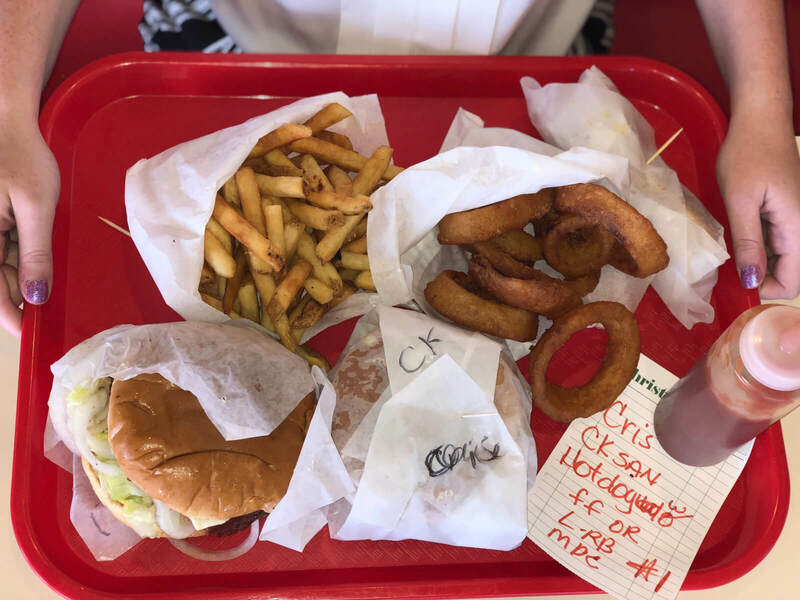 You can go for a side of fries but you would be missing out if you didn’t try their award-winning, hand-battered onion rings. You can also check out one of their Blue Plate Specials, the Protein Diet, which comes with either two burger patties or two chicken breasts and a side salad. Wash it all down with an old-fashioned, Blue Bell shake or try one of their various flavored teas. We recommend the coconut sweet tea. One step into this place and you’ll understand why this is a tried and true fan favorite. From the outside, it looks like a burger shack built in the ‘50s and on the inside it looks like your grandma’s house decked out in Red Raider and Texas memorabilia. Like us, you’ll want to make yourself comfortable in one of the little red booths and eat your way through the whole menu. As soon as you walk in, you’ll be greeted with a smile and the smell of sizzling burgers wafting from the kitchen. The menu features the Red Raider Burger (double meat, double cheese), nachos, hot dogs, gyros and even a Philly cheesesteak. At first, we were unsure of what to order so we asked the woman across the counter and she quickly rung us up for a couple of things. My favorite was the Christakis’s burger, a burger with an unusual (but incredible) combination of pastrami, cheese melting down the side of the burger, with lettuce, tomato, onions, and pickles that all synchronized in perfect flavor harmony. For personal preference, I topped it off with ketchup and let the pastrami masterpiece unfold. The chicken strip sandwich with lettuce, tomatoes, and mayo, a hot dog topped with onions and mustard tied for second. You can’t go here without getting an order of fries and onion rings. The onion rings had a crunchy exterior and a warm onion on the inside and I’m pleased to report that it didn’t fall apart like some onion rings do. Stop by this hidden gem and grab a Christaki’s burger, and I promise you’ll wish you had tried it sooner. 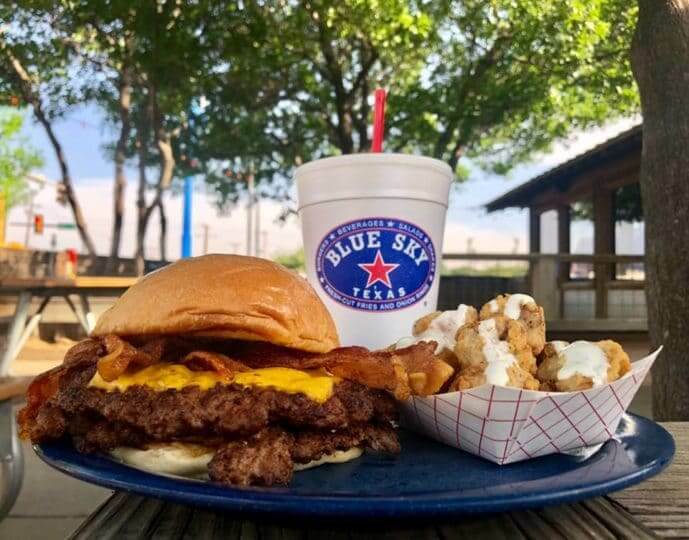 Next time you find yourself getting stuck in a burger rut, branch out and try something new that Lubbock has to offer. We’d love to hear which restaurant has your favorite burgers in the “Hub City!” Share your photos with us on social media using #LiveLoveLubbock and happy dining!